We saw in chapter five of the book that the younger Duvalier had been removed from power in Haiti, with active U.S. connivance, after a series of popular demonstrations. This led, within several years, to elections in which a charismatic protest leader, Father Jean-Bertrand Aristide, was elected president. Less than a year later, Aristide was overthrown by the military, having antagonized senior officers and other leading economic and political figures in the country's regime. During the course of 1992, the United States condemned the coup and attempted to work out a power-sharing arrangement in which Aristide would return as president while permitting the military and the prime minister it had installed to remain in place. Since the U.S. applied relatively little economic pressure on the junta (in fact, it lifted restrictions affecting U.S.-owned assembly plants in Haiti ), the generals, rationally, kept dragging their heels. During the first year of Clinton 's presidency, U.S. policy continued along more or less the same lines. Sanctions were tightened somewhat and this helped lead to a power-sharing agreement between Aristide and General Cédras, the man who had deposed him. As part of this agreement, the UN was to send an observer and training force with a lightly armed U.S. contingent. By the time they were dispatched, the generals had cooled on the agreement and did nothing to stop armed paramilitaries from preventing the U.S. contingent from docking in Port-au-Prince . In spite of this humiliation, Washington continued trying for a power-sharing arrangement as what its envoy called “a political coalition of the center.” Finally, the junta's reign of terror, its complicity with drug trafficking, and a growing anger among a key component of Clinton's coalition at U.S. double standards (removing Baby Doc and one of the generals who had succeeded him, but doing nothing about Cédras) led the U.S. to make a new push. 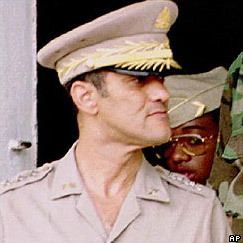 It persuaded Aristide to step down after his term had expired and to accept economic reforms favored by the country's economic elite and major multilateral lending agencies; it tried alternately to buy off the generals and provoke a coup against them; and it began planning (including obtaining explicit UN Security Council approval) for a military operation to restore Aristide. 1) Pezzullo, quoted in “U.S. Policy on Haiti Includes Search for Moderates,” Washington Post, 8 December 1993 (also, all Washington Post : “U.S. Envoy Spoke With Avril of Nixon's Final Days Before Haitian Resigned,” 12 March 1990; “U.S. Boosts Pressure on Haitians,” 4 May 1994; “Debate Over Risks Split Administration,” 25 September 2004); Bazin, quoted in Massing (1987); “Exit in Style Being Offered to Haitian Chiefs,” 20 June 1994; “Aristide Adopts a New Role: From Robespierre to Gandhi,” 18 September; “On the Brink of War, a Tense Battle of Wills, 20 September 1994; “Haitian Generals Regain Access to $79 Million,” 14 October 1994; all New York Times ; “U.S. Tried Covert Action to Rid Haiti of Rulers,” Los Angeles Times , 16 September 1994; Danner (1993a, 1993b, 1993c); UN Security Council Resolution 940, 31 July 1994: par. 4; Morley and McGillion (1997); Ballard (1998); Girard (2002).